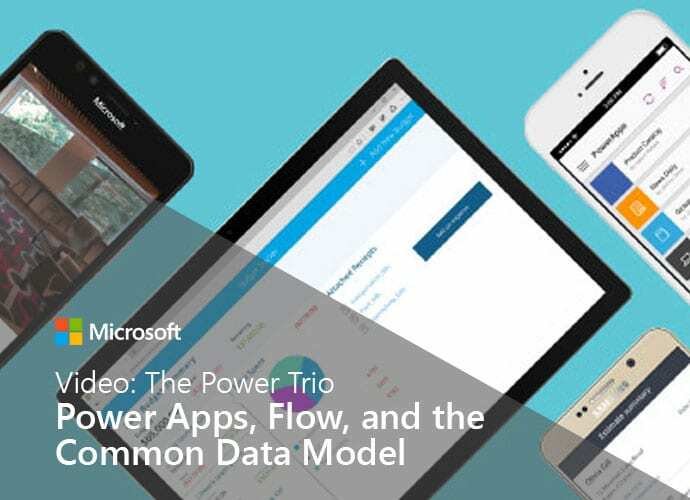 James Phillips, Corporate Vice President of the Microsoft Dynamics 365 team explains the vision for the “power trio” which includes PowerApps, Flow, and the Common Data Service (formally know as the Common Data Model). The pace of change across every industry and geography is accelerating and businesses need to adapt more quickly than they have ever before. In the past decades would go by before business would change their business models to engage customers, enhance their supply chain—that’s going from decades, to years, to months. Microsoft customers need a set of systems that enable them to adapt and conform to keep up with that change. This is the fundamental reason behind Microsoft’s investments in PowerApps, Flow, and the Common Data Service, which come in alongside Microsoft Dynamics 365 and Office 365. Together, they provide a platform that is adaptable and allows customers and partners to build solutions that are purpose-built for their own companies, for their industry, for functional roles, or even for specific geographies. This is a rapid application development services that requires little to no code so anyone can rapidly build web and mobile applications. It’s at drag and drop environment and you don’t have to be a professional developer to use it. Without writing a single line of code you can build very compelling, rich, visual solutions that can integrate with Office 365 and Dynamics 365 and even pull together data from many sources to produce an application that can fundamentally change the nature of core business processes—and doing it in days or weeks where previously it would take months or even years. PowerApps really is the foundation for mobile and application development and extensibility on the Dynamics 365 and Office 365 platform. This is a sister service to PowerApps that allows you to build and orchestrate a process that doesn’t need to have an application on the front but can be triggered based on any number of events. So if in Dynamics 365 for Sales there’s a new lead entered, you’ve got the ability to trigger a flow automatically that could then update a SharePoint site that could store some information in a OneDrive folder and insert something into your Dynamics 365 for Operations application, or to do anything from a custom code perspective that you might have available to you within your company. Flow allows you to automate business processes and again, just like Microsoft PowerApps, it is what Microsoft calls a five-second to sign up, five-minute to wow service that’s super easy to use with no coding required. These two services work very well together, and even with Power BI, to express some very complex, rich, and powerful business operations processes in a drag and drop environment. So if you have an application built using PowerApps and you click a button r take a picture, you can trigger a flow based on those actions. This is the underlying business entity or business object schema that Microsoft is standardizing on to pull together both Dynamics 365 and Office 365. The Common Data Service provides a rich, semantically relevant layer that provides entities like customer, invoice, inventory item, contact, calendar item, and so on, so looking across the structured business process environment and the unstructured, more ad hock productivity processes and yet interrelating all those objects. For example, when you have a new sales lead appear, it can create a new contact in Outlook. The CDS pulls together and provides this predictable, semantically rich fabric beneath Microsoft cloud business applications or any third party applications built on top of it and available to discover in the Microsoft AppSource marketplace. This is a very powerful trio that combines predictable data modeling with rapid application development and process orchestration, allowing an audience that previously would have had to rely on expensive and time-consuming custom application development to build applications and process flows that really move the needle for their business in rapid time. Microsoft customers can transform as the industry transform around them.